FieldReveal is a proven precision ag system and comprehensive mapping and data platform built for agronomists. To help celebrate the longevity of their success, FieldReveal needed a memorable way to mark their 20th anniversary and tapped MCG with the branding project. Over the last few decades, FieldReveal developed and evolved one of the most complete precision farming platforms that enables agronomists to clearly view comprehensive field data to make more efficient recommendations to their farmer customers. Designed to enhance partnerships between ag retailers and their customers, the FieldReveal system has been proven across millions of acres. FieldReveal serves as a cloud-based hub for agronomists and allows them to easily connect with others involved in a farming operation – soil samplers, field scouts, dispatchers, applicators, and farmers. Accessible anywhere with internet connectivity, it ties everything together and lets agronomists spend more time in the field with the farmer and less time in the office managing data and information. The branding campaign consisted of a tagline, logo, social media graphics, PowerPoint templates, online landing page, and tradeshow banner. The tagline “See Deeper with 20 / 20 Vision” is a play on FieldReveal’s 20th anniversary and their tagline, “See Deeper. 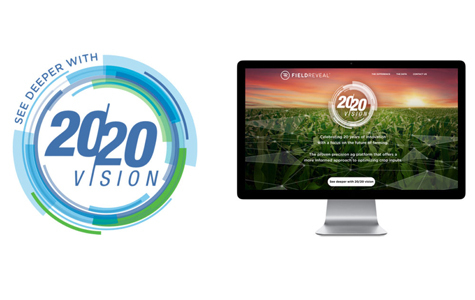 Farm Smarter.” To emphasize the 20 / 20 vision theme, we designed the logo as a series of concentric circles that come into focus, much like how the FieldReveal system allows users to see more clearly. All of the designs work to incorporate their existing grid pattern graphic, which represents digital connectivity on the farm. 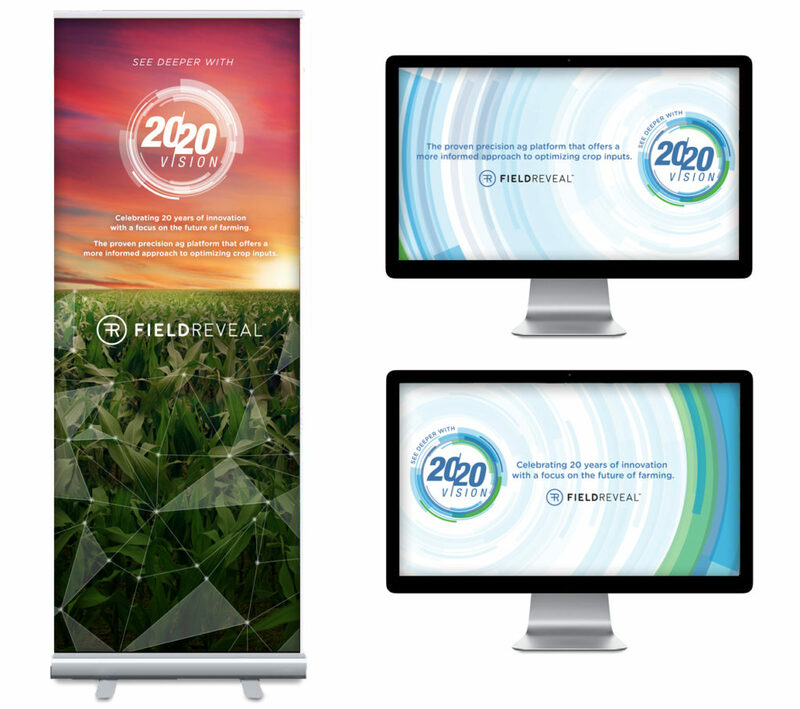 We were excited to play a role in FieldReveal’s 20th anniversary and look forward to celebrating the future of farming!